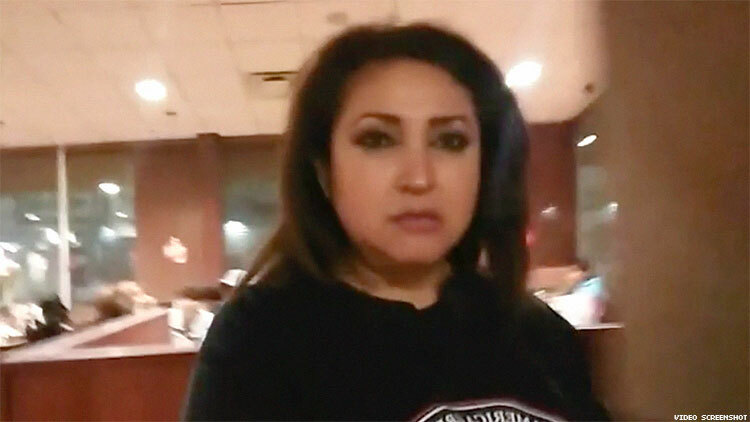 Jazmina Saavedra — running to represent California's 44th Congressional district — filmed herself stalking, misgendering, and accosting a trans woman at an L.A. Denny's. A Trump-supporting Denny's customer — who happens to be a longshot Republican Congressional candidate in Los Angeles — recently filmed herself confronting and chasing a transgender woman out of a stall in the ladies' restroom. Jazmina Saavedra, running to represent south Los Angeles and the city's harbor district in the House of Representatives, broadcast the whole encounter live on her Facebook page on Tuesday, all the while decrying the Obama administration's support for transgender people. Carrying a selfie stick and wearing a Trump sweatshirt, Saavedra bursts into the bathroom and starts yelling at the unidentified woman. 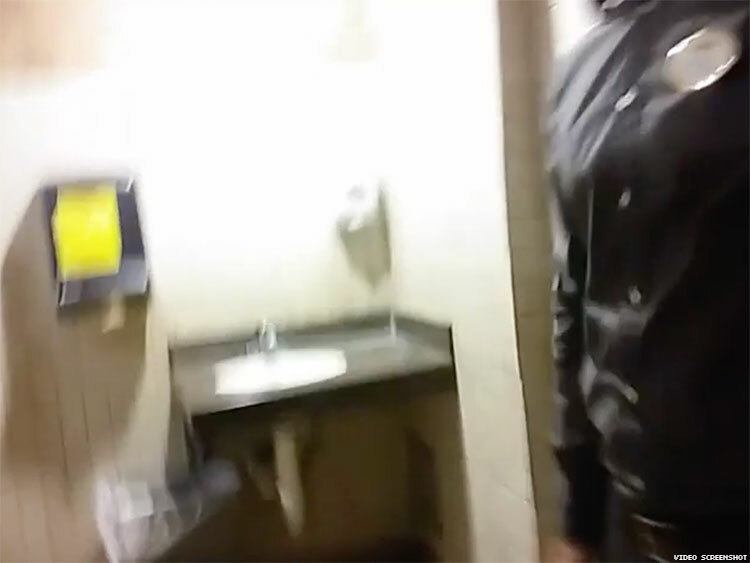 A man described in the video as the Denny's manager is already inside the women's restroom, standing outside the stall where the trans woman is hunkered down. "Why [are] you using the ladies' room?" Saavedra shouts at the trans woman from outside the stall, who replies, "You're invading my privacy!" "You're invading my privacy because I'm a woman!" Saavedra responds. As a manager tries to get Saavedra to leave the restroom, the Congressional candidate screams, "You violated my rights! You're sick. Stupid!" Saavedra walks back to her seat before saying, "So that guy violated my right to use the ladies' room here. He's saying he's a lady. Stupid guy. I'm going to wait for him to get out of the restroom." She heads back to the restroom and stakes out, pointing her camera at the door of the women's bathroom. "This is so stupid in California. You let people say, 'I'm a lady.' He's a man," Saavedra narrates to her followers on Facebook. "This is so stupid in California. This is what the politicians, the sick politicians, approve. They put us in danger, a woman like me." 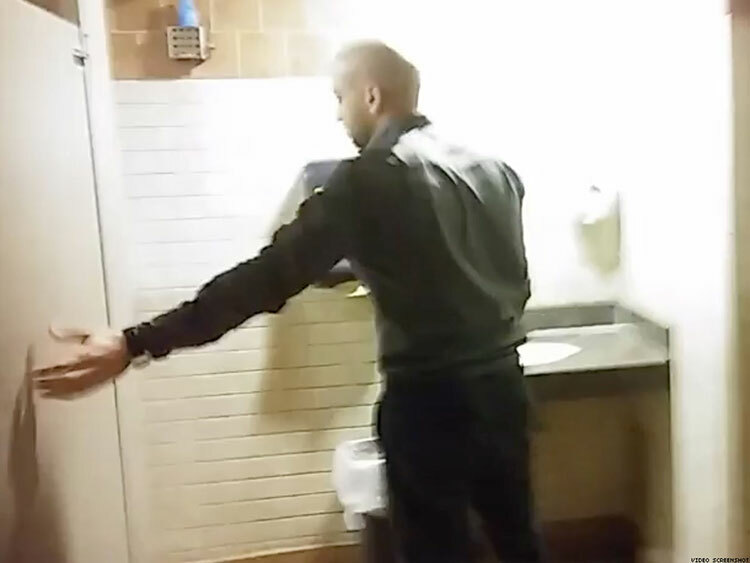 The trans woman exits the bathroom, with the manager leading her out of the restaurant. Saavedra again confronts the woman, saying she violated her privacy. The trans woman accuses Saavedra of singling her out and following her. "Next time use the men's room or no room at all!" 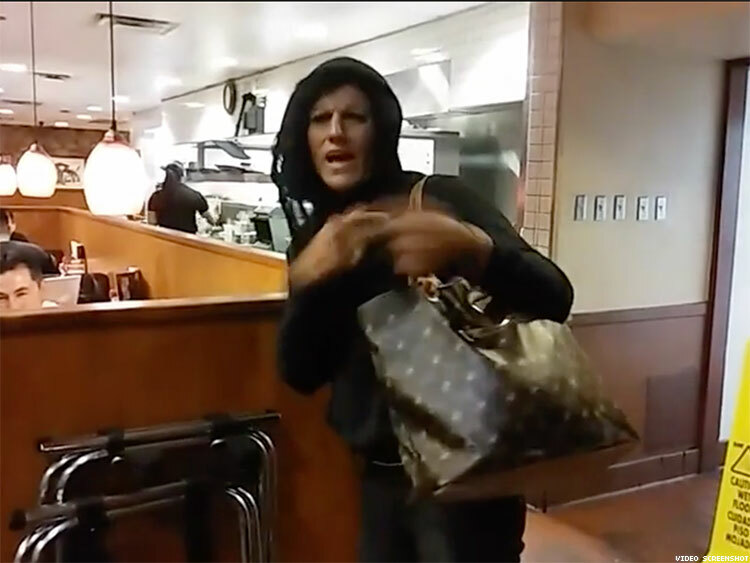 Saavedra screams at the trans woman, who is arguing with the manager. Saavedra then sits at her table and rants about how "men" are allowed to use ladies' restrooms in California. She shows off her pepper spray, claiming she was ready to use it. She said the manager helped her with the situation. "I was looking for my stungun," she says in the video. With the confirmation of Jeff Sessions as attorney general, the Trump administration repealed Obama-era guidance to schools that said they ought to recognize the gender identity of transgender people. He has attempted to ban transgender people from the military. And red states have repeatedly attempted to pass so-called bathroom bills, which ban transgender people from using the restroom matching their gender identity. 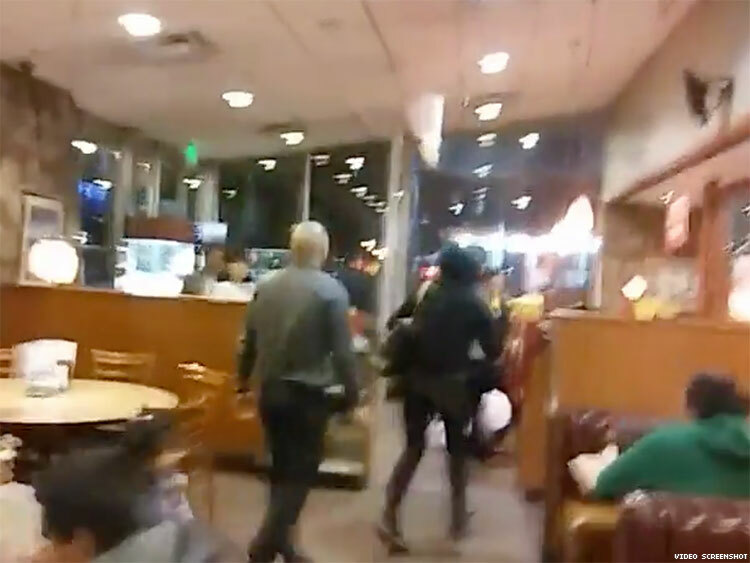 Once contacted by The Advocate, Saavedra disputed she knew the trans woman or was following her, something the woman says in the video while being escorted out of the restaurant. Saavedra continued to misgender the woman. "I was feeling afraid of being inside the bathroom with a man," Saavedra tells The Advocate. "I didn’t know he was gay [sic], I just heard the voice was a man. Another customer approached me and said that they were scared to go into the restroom because there was a voice of a man inside, and so I told the manager." The Advocate contacted corporate communications for Denny's in South Carolina but has not gotten a response. The story will be updated if a comment is provided on whether Denny's allows transgender people to use the restroom that matches their gender identity. The Denny's in the video is located in Los Angeles on Vermont Ave. and Wilshire Blvd., just five miles from the LA LGBT Center. "[Harassing the trans woman] has nothing to do with the LGBT agenda, he’s a man, simple as that, we were afraid to be in the bathroom," said Saavedra, not seeming to recognize that "LGBT" includes transgender people. "I don’t even know if he was a transgender; he was a man talking with a man’s voice, it was a man. I was in danger, everyone was in danger. This is a family values issue. We put our little girls in danger, this is not safe for our families." Saavendra is a Nicaraguan immigrant, but her campaign website says California has passed laws that "help aliens who have no legal right to be in our country." She also "supports President Trump’s agenda for the benefit of making both, a Greater America and Safer America. Jazmina is Pro-life and supports our Second Amendment... Jazmina will work to eliminate laws that affect our decent and hardworking citizens, as well as to prevent our children from being indoctrinated in schools with ideologies that corrupt and destroy our moral values." There has never been a case of a transgender person attacking or harassing anyone in a bathroom anywhere in the country. Instead, it's trans people who are subject to this kind of harassment. "Ignorance is not the sole province of one party or political perspective," Los Angeles LGBT Center Chief of Staff Darrel Cummings said in statement. "But the current Administration has emboldened people to express their ignorance and hatred in a way that is so odious and shameful that we are required time and again to actively resist. That a candidate for Congress can express such outrageous and callous disregard for another human being clearly demonstrates that she is not fit for public office. But just to be clear in case Ms. Saavedra does not get the message, ignorance, fear-mongering and harassment have no place in a country founded on principles of equality and mutual respect. On this International Day Against Homophobia, Transphobia, and Biphobia, let this candidate’s disgraceful behavior be a rallying cry for us all to stand up for what is right."